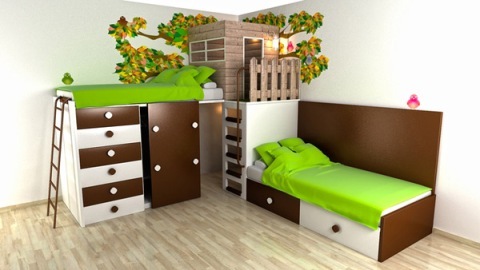 When designing your children’s bed room, it’s important to save space and to keep up beauty and colorful decorations as well. The room should be bright, ventilated and colorful; our choice is to use sleek pieces of furniture, corner wardrobes, or sliding ones with conventional doors, long sleek shelves and low cots, right blend of colors, using the walls and decor to enrich room with a spacious interior scene. We keep the room organized to provide your kids with the right space for play area within their rooms. The most important factor to consider is the kids’ likes and comforts that will be a smart approach. Adding bright colors like yellow, red and green will be a good idea and when you select your colors be sure they are water based to make cleaning easier and you can also use the wallpaper. Bed, cupboard , bookshelf and a study table are the essential pieces in a kid’s bedroom, when buying them be sure they are of good quality in both material and color used and they should have rounded edges to ensure your kid’s safety.